There are five spacious bedrooms at private villa Bajacu. They all have air-conditioning, ceiling fans, private ensuite bathrooms, cable TV with flat screen, DVD player, walk-in closets, phones, separate bath and shower with hair dryer, and a private terrace. Three bedrooms have king sized beds, and the other two bedrooms both have two double beds. Bajacu Private Villa is located on the island of Provo in the Turks and Caicos. Bajacu is a luxury private villa located on the island of Provo, in the Turks and Caicos. It is located in a peaceful haven amongst 11 acres of lush tropical gardens – the perfect escape for your luxury holiday! Bajacu means “rising sun” in the native Caribbean tongue. The villa is situated on a hilltop with magnificent 270 degree views of the ocean, and a natural stone path provides direct access from the villa to the sea where snorkeling can be enjoyed. 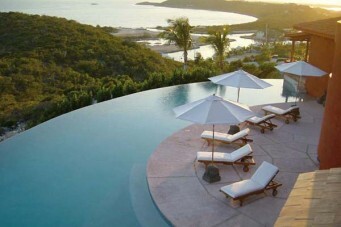 There are also two beautiful infinity pools that cascade into each other. Bajacu private villa has an open air living room under a large palapa, and there is a pergola linking the palapa to an inside living room – which is all surrounded by the pool! The interior décor consists of antiques from China, Indonesia and Africa and there is a variety of unique artwork present also. There are plenty of private areas for relaxing in total privacy. The villa houses a formal indoor dining room which can seat 16 people, and there is also a protected outdoor dining area. Bajacu was designed by Marco Aldaco who is a world famous Mexican architect, and it was completed in 2004. There is 9500 square feet inside, and 3500 square of open deck. There are five air-conditioned bedrooms, which all have ensuite bathrooms and private terraces with beautiful sea views. There is also an office with a computer, internet access and a fax. There are also additional bathrooms in the living room and office (total of 7 bathrooms). The villa is fully staffed with a cook, butler, gardener and 1-3 maids. There are two staff members that live on site in separate staff quarters. Bajacu has its own fresh water making plant, and guests can also enjoy the fresh fruit and herbs grown on the estate. There is a minimum booking period of 7 nights all year round, except over Christmas and New Years when it is 14 nights. The villa has a secure alarm system, computer with internet access, DVD players, two pools which can be heated, safety deposit box, satellite TV, telephones, fax machine, and WIFI. The villa is fully staffed to cater for all of your needs including a butler, chef, gardener and maid service daily.